The Dewalt 40V MAX 4.0 Ah Cordless Lithium-Ion 22 in. Hedge Trimmer has a high output motor and laser cut, hooked tooth blades engineered for clean, fast cuts on branches up to 3/4 in. thick. If obstacles are hit during cutting, the friction clutch engages protecting the transmission. I love the 40v hedge trimmer and plan on purchasing the string trimmer and the blower. Really a great tool , very quiet. THe trimmer is well built and works very well for me. MY only complaint is that it does have some heft to it and after about 15 minutes it does get heavy. Get the power of a gas trimmer with the convenience of cordless. I've been very impressed with the run time and power so far. Looking forward to having this around for years to come. what is the extra part - metal piece/guard - in the box with the trimmer? What am I supposed to do with it? allows you to mount the entire unit on the wall. keep the work bench clear. You mount it on the wall and the battery charger slides on to it. The extra peice is a wall mount for your unit. It says that the product cuts 1/4 inch but then says it cuts branches up to 3/4 inch. BEST ANSWER: The maximum cutting capacity of the Dewalt dcht860m1 is 3/4". Its cutting capacity is 3/4 inch. Does Dewalt make a 20Volt hedge trimmer. I have a 20V line trimmer and 20V blower, so would want a bare 20V hedge trimmer. Check your local HD. Ours is carrying the bare ones now. Can the 40v hedge trimmer be used with the 40v 6.0Ah battery? Has anyone compared the 20 volt and 40 volt cordless trimmers in terms of performance and power? I have a large amount of mountain laurel to trim and do not want to be frustrated by a trimmer that lacks power. BEST ANSWER: The 40v version would have significantly more power than the 20v. The run time is contingent on the amp hour of the battery. A 20v 3 amp hr battery will have the same run time as a 40v 3 amp hr battery. Can you buy the hedge trimmer without the battery pack - I already own the trimmer and the batteries are interchangeable. 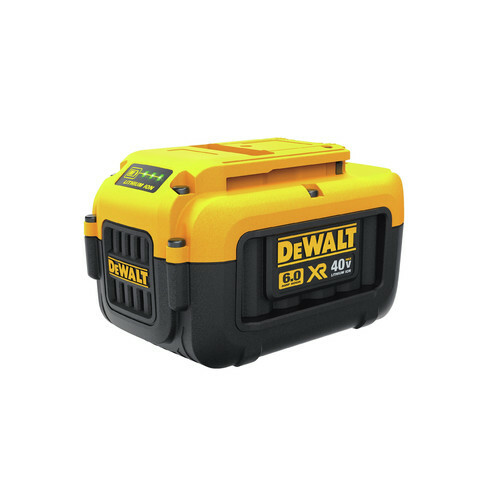 BEST ANSWER: The Dewalt 40V MAX 4.0 Ah Cordless Lithium-Ion 22 in. Hedge Trimmer only comes in a kit,with battery and charger. app how long will this 40 V hedge trimmer run on a battery charge? BEST ANSWER: Theoretically this battery will last 2.5-3 hours on a single charge. Practically, it depends on how hard you push the hedge trimmer on how long the battery will last. does it weigh 11.9 lbs with battery or without battery. BEST ANSWER: The trimmer weighs 11.9 without battery.